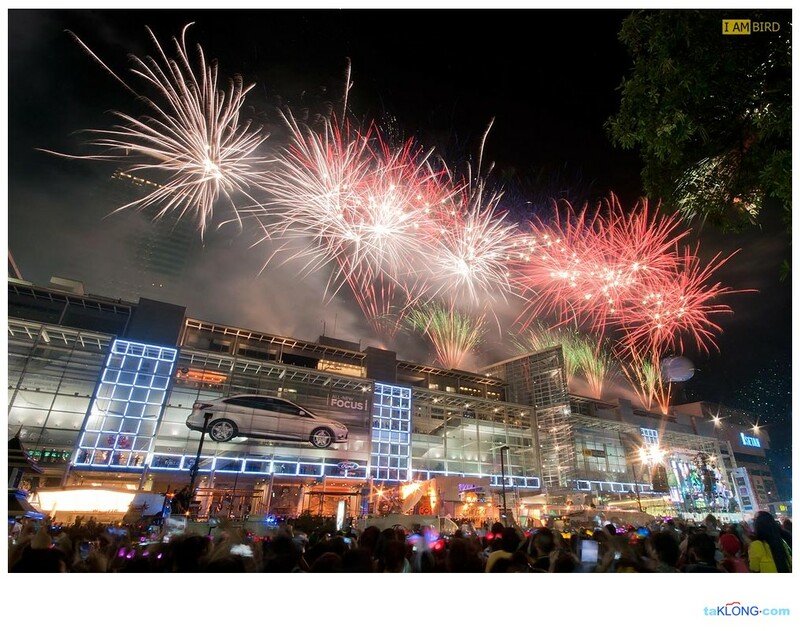 ﻿ The pix above is taken from the fireworks display at Central World on new year's eve. It was a huge crowd here. My first trip to Bangkok was in May 2006 with my close buddy, Zue. And after more than 6 years, Izan, another close buddy of mine decided to celebrate New Year in the city of Bangkok, coz she never been here. Since there are 2 people in the group who has visited Bangkok before, we were appointed the tour managers. We were responsible for the places to go, lodging and transportation. I made flight booking sumwhere in September. We bought MAS for RM550 return each. Cheap, right? Maybe not that cheap but it was during peak time, during New Year celebration. Flying out of the country during year end has become a habit of me and my friends. We were in Singapore for 3 consecutive years! This year, it's Bangkok. We boarded MH796 on Friday nite and reach BKK at about 11 pm. Custom clearance and picking up luggage, it was near to midnite and we thought of taking the airport train to BKK city and then, take LRT to our hotel. But we were informed that although we cud get on the last train to bkk but we cud not take the lrt since lrt stops at midnite. So, off we go to the hotel with cab. It cost us about 700 baht. Which i think pretty reasonable considering it's past midnite (surcharge of 1.5 from actual price after midnite, just like in KL). We reached Convenient Park Hotel (which is very near Punawithi Lrt station), unpack stuffs and sleep. The time difference between KL and BKK is one hour. But sunrise is at 630am and maghrib is at 610pm. The next day, we went to Chatuchak market. There are just soooo many things to buy, especially for all the girls out there. Accessories like necklace, bracelet, earings are abundant (well, Tiffany are here, but it's Bangkok brand). Handbags, shirts, blouses, shoes n sandals, keychains, just everything. And you can definitely bargain to the price you want. But be reasonable ok. The rules is always to get half of the price being offered. The things that I bought here: Deuter convertible hip and bagpack, North Face bagpack, keychains and fridge magnets. We ate at a halal stall here. Quite expensive. My tomyam and white rice cost me 340 baht (RM34). But I noticed that halal food is really expensive in BKK. The cheapest I manage to get is in Prabhurat (Indian town), which is really cheap, for about 50 baht. But it's quite a secluded place and we went there from Grand Palace via tuk-tuk for 100 baht. I initially swore never to get on tuk-tuk but once on it, it was fun. The reason I was reluctant at first coz I heard so many stories of tuk-tuk driver cheating on distance and will drive you to places that you dun want to go. But this does not happen in this trip. So, I guess, only the unluncky ones got that bad experience. Tuk-tuk dfntly on my good list now. Just confirm the price before getting on the tuk-tuk. After Chatuchak, we went to Paragorn. Have dinner here at the only halal restaurant here (veryyyy pricey). Wanted to watch movie at Imax but no movie currently showing which really attracts our attention. But hanging out at Imax surely a delight. Managed to get pictures here and there since they are having some deco for christmas and new year. Second day is spent on Floating Market, Dam Noen Saduak. It's quite far from bkk. About 2 hours ride in a car. After my friend's bad experience on this market (she was made to pay 400 baht for taxi ride to and fro the market and that excluded the boat ride which is another 1000 baht, crazy huh?) , I decided the best way to get there is by van (bus is cheapest but stops at many places). We took van from Victory Monument (exit no 2), and managed to get on the first van to the market. We paid only 90 baht each. However, we forgot to tell the driver that we wanted to stop at the entrance of the market. Because of language barrier, we took for granted that the driver would stop us at the entrance. He dropped us at a pier instead. Because each of us wanted to answer to "nature calls", it was too late when we realized that we have been dropped at a boat pier. As expected, there is an agent eager to discuss on the package. We immediately stopped her, saying that we didn't want to go on the boat. We just wanted to get to the entrance. She insisted that there is no way that you can get to the market without getting on the boat (which is typical, as many in tripadvisor, blogs, etc mentioned). She then sent us to the tour manager which tried his best to convince us. But we were adamant. We didn't want to get on the boat. Frustrated, he told us that we can walk to the market but it is very far (3km he told us, but no, it wasn't that far, wat a cheater!) and taxi is not easily available here like bkk (which is true). Since there were many taxis at the pier, we wanted to get on one of them. But none will take us there. However, one of the taxi driver told us that we can just walk there, not that far. Thank you uncle, we luv you!. So, we walked. There are signboards, so no need to worry! And along the way, there was an uncle offering to bike us to the market for 20 baht each. It was cheap, but we decided to just walk. Also, you will see many piers with people trying to tell you to get into the boat for cheap price. Just ignore them. Don't stop until you really see the entrance of the market. Once there, we were so happy! We walked along the market, and when we see the mango sticky rice, we quickly decided to stop and eat near the aunty selling it. It was delicious!! When we walked further up, an auntie offered us to take a sampan paddle ride for only 100 baht. Why not? It's totally wayyyy cheaper that having to pay 1000 baht at the pier. We definitely enjoy the sampan ride. And also the coconut ice-cream. A must have! On the third day here, we decided to go to Grand Palace. We went by train to Saphan Taksin and took a boat ride to Tha Chang pier, where we can just walk to Grand Palace. This place is just majestic. We were there on 31st December, and wat a crowd! Just too many people, especially the foreigners. After snapping pix and enjoying this place, we decided to go to Prabhurat, an indian town. For halal food. We took a tuk-tuk for 100 baht and when we got there, initially we wandered around the place. Then we see a muslim aunty and followed her but we lost her. So, we were just going here and there and saw few shops selling thai silk at cheap price. After buying the thai silks (not me! ), the seller showed us on how to get to the only halal food stall there. The food is definitely the cheapest we have in bangkok. After lunch, we performed our prayer at a nearby mall (shown by the stall owner). Then we took tuk-tuk to get the nearest pier. There are many boats along the Chao Phraya river. If you want to go on the cheapest boat, insist on the orange boat which only cost you 15 baht. Then we headed to MBK for another round of shopping. When we get there, there was a lady passing flyers. Initially I just ignored it but when my friend looked at it, it was flyer on prmotional massage. Thai massage is only 250 baht for an hour! We decided that we'll skip the shopping and go for massage. It was totally worth every baht I paid. After 3 tiring days, it's definitely a great ending for my trip. The trip ended with fireworks at Central World. There are like thousand of people already when we get there. We managed to secure a spot and sat there for more than 2 hours just for the FIVE minutes fireworks. Well, that's a letdown. I watched one of the most spectacular fireworks display at Marina Bay Sand which lasted for 15 minutes! Well, I guess I can't have too many good things in a trip, right? Since the train operated till 2 am for new year eve, we got on the train to the hotel. But, pushing and shoving along the way to the train is just unbearble. And there were some crazy prople in the crowd. They are just so scary. It took us 40 minutes to get on the train. Once getting into the airport, it was another 4 hours before departure. Well, we were tired but it;s impossible to sleep. Days in Bangkok is already over, but we missed bangkok already....till then bangkok!